A fun photo project done on a cold winter day. During the cold winter months I sometimes turn to an indoor photo project just for fun. I’ve had considerable fun with these wooden mannequins on occasion. 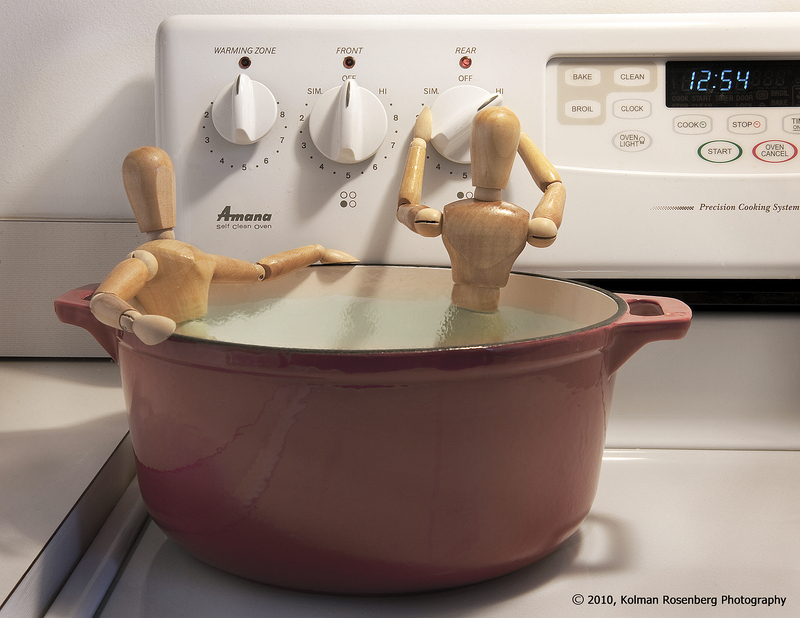 One particularly cold day I came up with this concept of having the mannequins devise their own hot-tub on the kitchen stove. There is a bit of Photoshop trickery here. The pot was shot filled with water, without the mannequins and also shot with the mannequins but without the water. The camera was on a tripod and nothing was moved between the 2 shots. The 2 images were then combined in Photoshop to give the final photo. You may see future photos of my “woody people” on the blog. I’ve got a notebook full of ideas and have already shot some of them! This entry was posted in Uncategorized and tagged Amana, cold, hot-tub, kitchen, mannequin, photoshop, project, range, stove, winter, wood, woody. Bookmark the permalink. Kolman, keep playing. You are having fun with all your photos. I certainly am and will keep it up! Kolman–That’s fun & funny, two of my favorite things. It was fun concocting too! Thanks Carole!